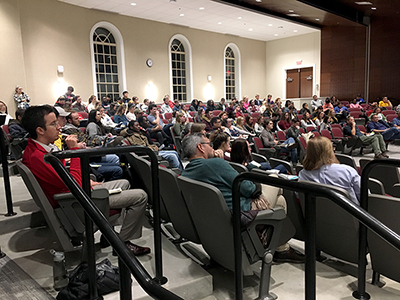 The large audience consisted mostly of undergraduate students. An integral part of a Miami education is the opportunity to engage students with successful alumni. On Monday, November 12, over 100 students gathered in Shideler Hall to participate in the 3rd annual alumni career networking event for the Department of Geography, Department of Geology & Environmental Earth Science, and the Institute for the Environment & Sustainability (IES). Students of these departments learn valuable information in the classroom every day, but many of them often wonder where their degrees can take them. The panel of alumni showed current students a range of post-graduate careers. Jonathan Levy, director of the Institute for the Environment & Sustainability, introduced the guests and moderated the panel of questions from students. 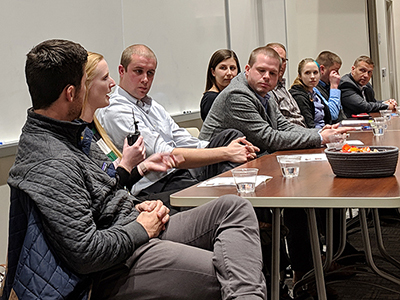 Geography, geology, and IES students eagerly asked advice of the prominent alumni, wondering about the best ways to stand out in their different fields. Students in the room jotted down notes as the alumni gave advice on resumes, interviews, and shared stories from their undergraduate and graduate years at Miami. To end the panel, alumni gave advice they would give to their undergraduate selves from where they are today. Following the panel, there was a 15-minute break in which students were served free snacks. The group then broke into roundtable discussions to interact more closely with the alumni panelists. "It was really interesting to see that alumni from different departments had such shared and cross-cutting experiences, showing the complementary nature of the different kinds of learning happening here," said David Prytherch, professor of geography. Will Swales, a junior majoring in environmental Earth science and co-majoring in sustainability, has attended the event for the past three years and said this is the biggest turnout he's seen yet. "It was good to learn the diversity of different opportunities in my career field," he said.